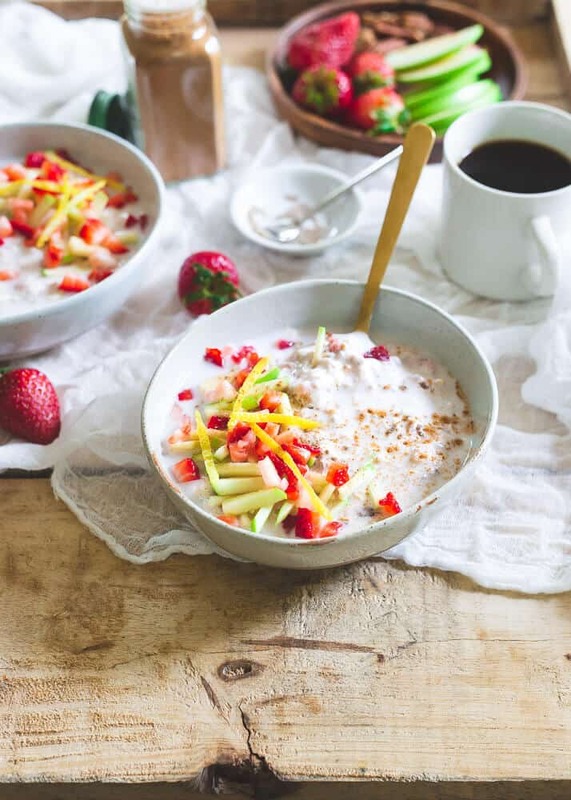 Strawberry lemon overnight muesli is a delicious, hearty, bright spring breakfast packed with healthy fiber. Assemble everything the night before and have breakfast waiting for you in the morning when you wake up. Alternative title for this post: The low-down on fiber. We’ll get to this strawberry lemon overnight muesli recipe in a bit but first I want to talk about all things fiber. *This post is sponsored by Metamucil® Free. I’m sure you’ve heard about soluble and insoluble fiber before. Do you know though what the difference between them is? This type of fiber dissolves in water and forms a gel-like material in the digestive tract that helps lower cholesterol and maintain healthy blood sugar levels as part of your diet. Sources of soluble fiber include oats, barley, fruits, legumes (beans and peas), and psyllium, the main ingredient in Metamucil. This type of fiber is the one that helps slow down digestion and keep you feeling full longer. Insoluble fiber does not dissolve in water and makes its way through the digestive system mostly intact. It adds “bulk” and may help speed the passage of food and waste through your gut. Insoluble fiber sources include things like wheat bran, whole grain cereals, breads, and lots of vegetables. It’s worth noting many plant-based foods like vegetables, beans and whole grains contain both types of fiber which is why it’s important to include a wide variety of foods in your diet. My preference when it comes to fiber types is soluble fiber. As someone who focuses on eating a macro-based diet, satiety is incredibly important to me. I prioritize my foods based on how full they leave me feeling to get the most bang for my caloric buck so to speak. Foods high in soluble fiber have been found to reduce appetite and increase satiety more so than foods with a high insoluble fiber content. So, it’s no surprise my diet is heavy in things like fresh fruits, vegetables like broccoli and Brussels sprouts, beans and oats (love these oat bran pancakes!) – all higher on the soluble fiber side. That said, there are times when despite My Fitness Pal telling me I’m killing the fiber game (I usually have no issues reaching the recommended target of about 25 grams of fiber per day for women through my food choices), I still have issues…if you know what I mean. In fact, this post really comes full circle for me and I have to laugh at the childhood memories of having Metamucil at the table of my grandparent’s house circa 1989, a concerned grandma hovering over me making sure I finished the full glass. Metamucil is made with 100% natural psyllium husk. The psyllium fiber forms a viscous gel that traps some bile acids (made from cholesterol) and gently removes them from your body. This gel also traps some carbohydrates and sugars, allowing them to be more slowly absorbed by the body and helps keep you feeling less hungry between meals*. 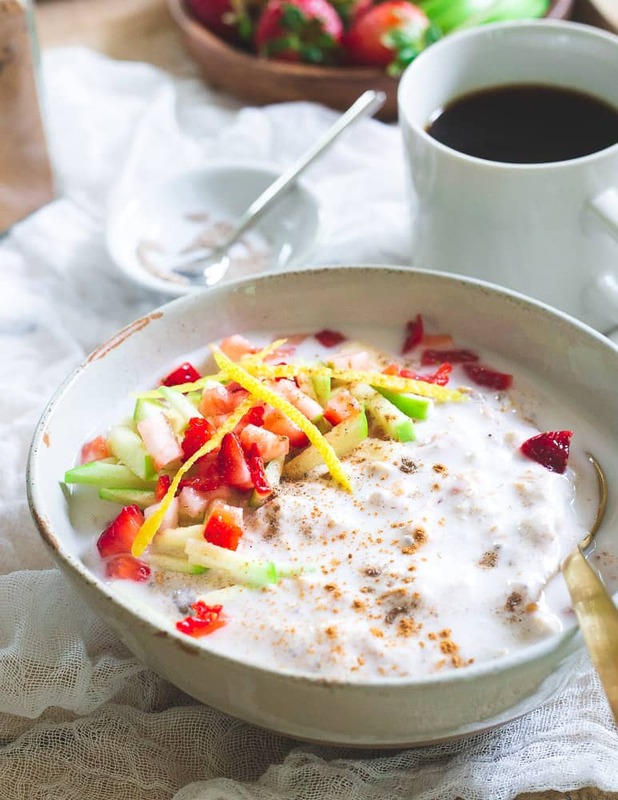 Whether you’re falling short of your daily fiber goals and looking for a way to increase your intake or, you just find yourself needing a little “help” getting the digestive tract flowing (like me! 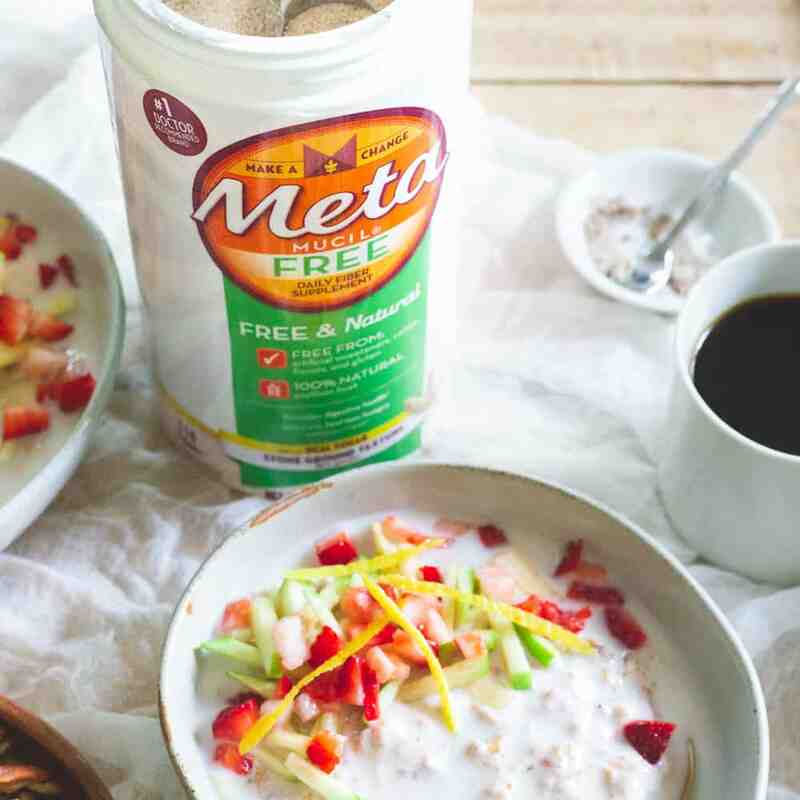 ), Metamucil is an easy addition to your daily diet so you can stay regular* and provides a bunch of easy fiber options. 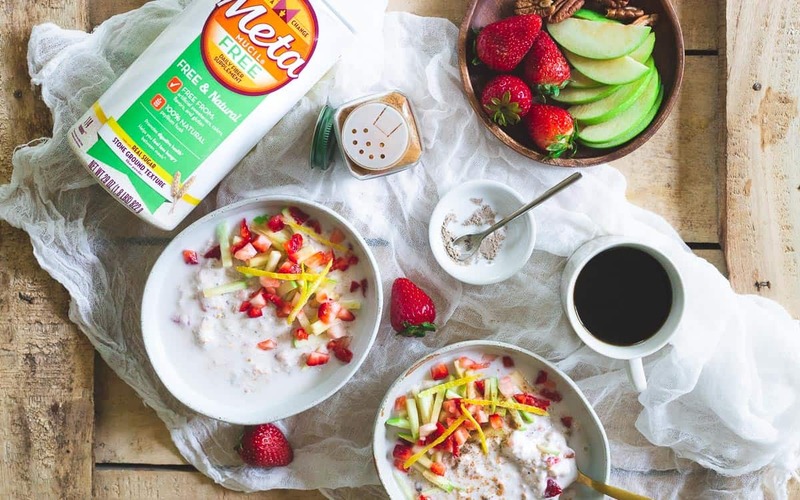 These days, Metamucil Free – made with real sugar and free of artificial sweeteners, colors and flavors is my preference (it’s gluten-free too). 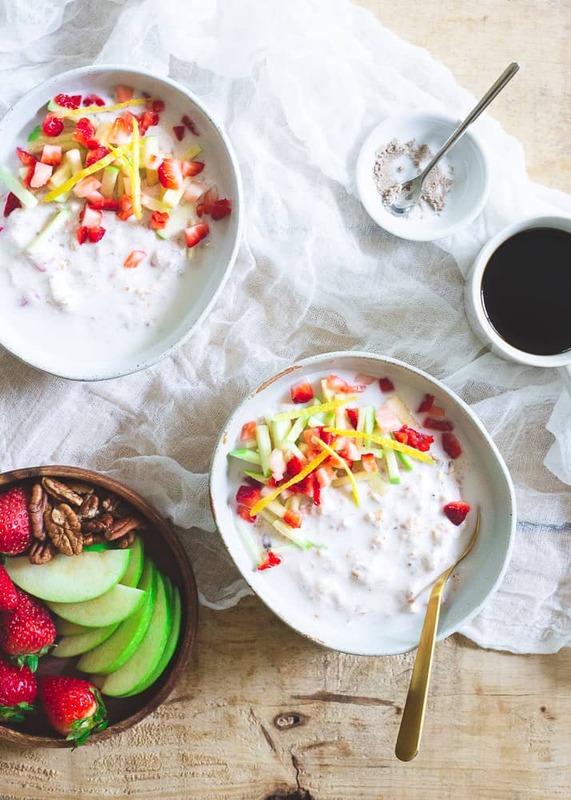 It’s perfect simply mixed in a glass of water, blended into your favorite smoothie or, added to a simple breakfast like this strawberry lemon overnight muesli. I got on a muesli kick last month after our trip to Barbados. The breakfast buffet had this amazingly delicious healthy muesli recipe I ate every morning sparking an obsession upon my return home. I’ve made overnight muesli it a bunch of ways since but this spring-inspired strawberry lemon twist might be one of my favorites. It’s bright and refreshing while still being hearty and satisfying. Soaking muesli overnight is very similar to overnight oatmeal, time literally does all the work for you while you sleep. 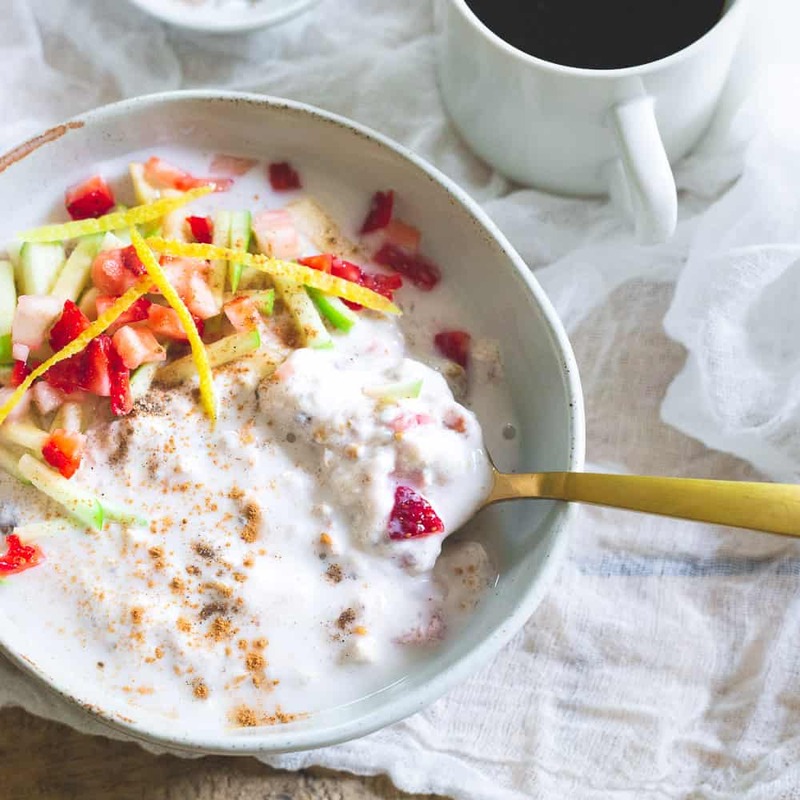 This overnight muesli recipe couldn’t be easier, you simply combine all the ingredients at night, cover, refrigerate and go to bed! In the morning, you add the last cup of milk and your toppings. That’s it! It’s really a great breakfast option for anyone in a rush in the mornings or even packing up and taking to work. You could even prep your muesli toppings the night before and keep them in a separate container. What’s the Difference Between Muesli, Bircher Muesli and Swiss Muesli? All these muesli terms confused the heck out of me when I was researching so let me help clarify in case you’re wondering too. Regular muesli is a dry mix usually consisting of things like oats, grains, dried fruits, seeds and nuts. You’d eat it by combining with milk on the spot or using it as a granola like topping for yogurt bowls and such. 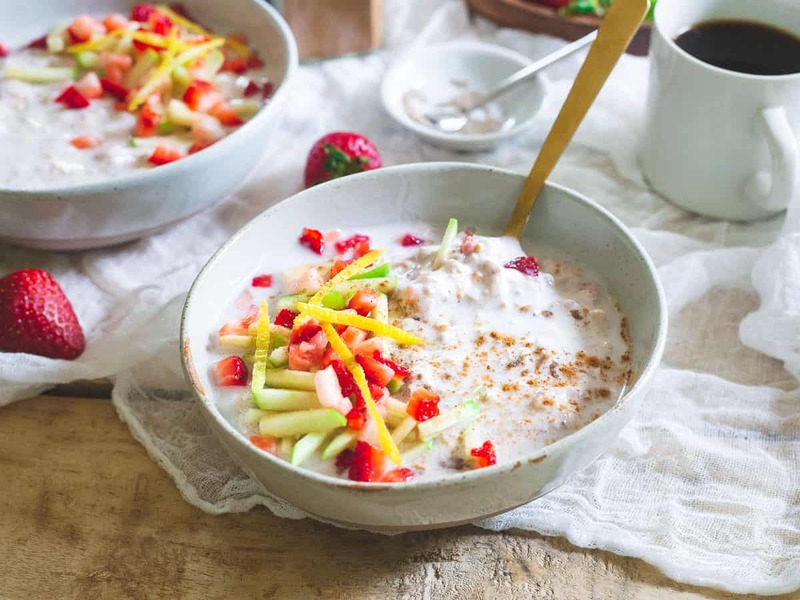 Bircher Muesli is soaked with milk/cream and lemon juice along with other usual ingredients like honey, cinnamon, fruits and nuts. Overnight muesli is basically the overnight version of bircher muesli. So in reality this is really an overnight Bircher muesli with strawberries and lemon! No matter what you call it though, nothing beats 10 minutes of prep the night before and waking up to breakfast totally ready to dive into. Love this overnight muesli recipe? You’ll probably like these almond joy oats, this baked turmeric oatmeal or, these peaches and coconut cream oats too for more fiber packed breakfast options! Combine muesli, Metamucil® Free, raisins, pecans, chia seeds, yogurt, 1 cup of milk, vanilla, cinnamon, nutmeg and salt in a bowl . Stir until all the ingredients are mixed together well. Gently fold the strawberries and lemon zest into the mixture. This breakfast looks incredible, I will be trying this recipe very soon! I laughed when I read the part about your grandmother because Metamucil was always a part of breakfast at my grandparents’ house. This muesli looks like a fantastic breakfast! Your Strawberry Lemon Overnight Muesli will be a great addition to my fiber-filled diet! Since I chose to add fiber to my routine, I feel better and more energized, ready to take on the day, and exercise! Along with proper nutrition and using my smart scale to monitor my progress, I have never felt and looked better! Adding fresh apple and strawberry can really brighten your morning! This is really mouth-watering, that is why I would love to follow this recipe as soon as tomorrow! The good thing about this recipe is that its ingredients are not hard to find. I can complete them by simply visiting my local grocery stores! Thanks for sharing this with your readers! Now, breakfast will be less boring and more exciting with this fiber-rich menu!